The Harpies, who, like the Furies, were employed by the gods as instruments for the punishment of the guilty, were three female divinities, daughters of Thaumas and Electra, called Aello, Ocypete, and Celæno. They were represented with the head of a fair-haired maiden and the body of a vulture, and were perpetually devoured by the pangs of insatiable hunger, which caused them to torment their victims by robbing them of their food; this they either devoured with great gluttony, or defiled in such a manner as to render it unfit to be eaten. Their wonderfully rapid flight far surpassed that of birds, or even of the winds themselves. If any mortal suddenly and unaccountably disappeared, the Harpies were believed to have carried him off. Thus they were supposed to have borne away the daughters of King Pandareos to act as servants to the Erinyes. The Harpies would appear to be personifications of sudden tempests, which, with ruthless violence, sweep over whole districts, carrying off or injuring all before them. According to the advocates of the physical theory of interpreting mythology, the Harpies were personified whirlwinds; certainly, at an early date these were associated with those demons that directed their movements. Homer thought of them as suddenly carrying away human beings. Hesiod thought them to be winged maidens whose flight was swifter than that of birds; he mentions only Ocypete and Aello. Later poets depict them as having bodies of birds, claws of lions, with faces of maidens, but pale and emaciated, these poets named three—Aello (storm), Celaeno (obscurity), Ocypete (rapidity). It was said that these beings would suddenly carry away food from those whom they wished to punish. Sources: E. M. Berens, A Hand-book of Mythology: The Myths and Legends of Ancient Greece and Rome (New York: Maynard, Merrill, & Co., 1894); S. A. Scull, Greek Mythology Systematized (Philadelphia: Porter & Coates, 1880). In the Journal of Hellenic Studies 13 (1892-3): 103-114, Cecil Smith published a much-cited article on the "Harpies in Greek Art." The article is far too long to reproduce here as it is not directly relevant to our topic, but The Athenaeum for February 25, 1894 summarized his article in a concise abstract that gives the most important points about the Harpies and what they meant to the Greeks. The article was then reproduced in the "Archaeology News" section of the American Journal of Archaeology. NOTE: The following article contains a racial reference that modern readers may find offensive but which was part of the original 19th century work. By a confusion of ideas it is still constantly asserted that the Greek harpy had sometimes the body of a bird, like a siren; this error has arisen from the fact that in the adaptation of Greek myths to Roman ideas these two types in Roman times had exchanged rôles, the siren reappearing as a draped woman, the harpy as a bird-woman. Throughout Greek art proper the type of harpy is invariably a winged woman, and therefore the famous "harpy tomb" from Xanthus is wrongly named; the bird-women on this tomb are really sirens, performing functions akin to those which we usually see on Greek sepulchral monuments. 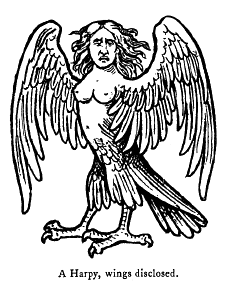 Through all Greek times harpies are associated with the idea of wind, of great speed, and disaster; the Homeric idea is indeed in this myth, as in others, a fault in the stratification; here their number is not stated, they are associated with the idea of the snatching of death, and this death is regarded as inglorious. Probably, with the later modified notion of death, the harpies retained only the repellent part of their character, and were consequently no longer regarded as sepulchral. Hesiod makes them two in number, Aello ("Stormwind ") and Okypete ("Swift-flyer"); and from other passages we see that the myth wandered throughout the Peloponnesus, the Aegaean, and up to the Hellespont. One of the earliest representations of them on vases is a cup of Kyrenaean fabric, which shows us the Hesperid Kyrene; on one side of her fly several bearded figures (Boreades) as if to protect her from the harpies on the opposite side. It looks as if this phase of the myth, in which harpies and Boreades are opposed in an allegorical nature symbolism, had grown up at Kyrene, or at any rate on the north coast of Africa: here the north wind coming from the sea assists vegetation, the wind coming from the desert destroys it. The trade relations of Kyrene would account for the localities over which the myth wandered; in its more northern home, however, the myth required modification, inasmuch as there the beneficent character of Boreas is not so obvious, though the harpy still remains the parching south wind; hence in the Hesiodic theogony (which corresponds with Peloponnesian types of art) the harpies have for their sister, not another wind, but Iris the rain-giver. Meanwhile, the traditional type of opposing Boreades and harpies passed on into the Phineus legend, but with its old significance as a nature-symbolism lost; the only instance of its direct connexion with nature-symbolism is the Würzburg cup. This cup has on one side the Boreades driving away the harpies (both represented exactly as on the Cyrenaean cup) from the food of Phineus; on the reverse, Dionysos, Scilenoi, &c.; the whole being an allegory of the joyful reawakening of Nature after the expulsion of the forces hostile to her. The symbolism of nature is an idea specially at home in Egypt and the adjoining countries; for this reason, and considerations of technique, the Würzburg cup may be attributed to one of the Graeco-African colonies. The same contrast of ideas is found on a situla from Daphnae. On the obv. side is the archaic snake-legged figure of Boreas among plants and foliage; on the rev., a figure which is certainly a harpy; beside the harpy are shown a locust (Acridium peregrinum), and a vulture and two carrion crows attacking a hare. The locust is frequently found on coins and vases, as symbolizing the destruction of vegetable life; the birds represent the destruction of animal life. A parallel usage is found on the vases of "Coeretan" fabric, which have already been attributed to Egyptian influence. The association of the carrion crow and vulture as destructive agents is traceable all through art, from the early reliefs, in which they devour corpses on a battlefield, downward; the latest example is on a patera of the third century A. D., on which they are still associated with the land of apes and negroes. “Harpies in Greek Art,” American Journal of Archaeology 9 (1894): 425-426.